interrupted by a third bird, giving rise to their curiosity over the function of these interventions. 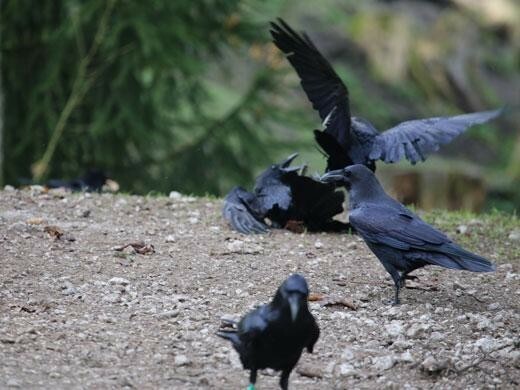 Given that ravens have been previously shown to track the dominance relationships of others, they wanted to know if there was a relationship between bonding status and the likelihood of being an intervener or being intervened. In both cases they found that there was a significant relationship between the two. Birds who were either a pair or at least strongly bonded were most likely to intervene, and those attempting to forge loose bonds were the most likely to be interrupted. The researchers interpreted these results to show that strongly allied birds attempt to preclude the threat of competition by squashing the alliances of future coalitions. Importantly, they were less likely to bother with nonbonded birds since, for now, their social ties are too weak to become threatening. Conversely, they also stayed out of the interactions of other pair or strongly bonded birds since these interventions pose a greater physical risk to the third wheel. These results are quite intriguing but there’s still a lot to vet and better understand before they will be widely accepted. Critically, there is no immediate benefit to the intervener. Embracing the results of this study requires accepting the idea that an animal, especially a bird, is capable of putting future rewards ahead of current risk or losses. Loose bonds are too weak to act as a competitive threat, so this effort on behalf of the intervener is only useful if you assume that those loose bonds will become a threat if allowed to flourish and become stronger over the course of days, weeks or months. Risking a fight now to thwart a relationship that only may be problematic next month is a big temporal leap. As humans, this kind of future planning is an ability we take for granted but it’s quite a cognitive feat. Although the scales are beginning to shift, I imagine we have many more studies to go before results like this are considered representative of the temporal flexibility of ravens and other corvids.